Cuora picturata is protected from commercial exploitation in Viet Nam as a Priority Protected Rare, Precious and Endangered Species under Decree 160/2013/ND-CP of the Government. Cuora galbinifrons picturata was included in CITES Appendix II on 19 July 2000. A zero quota was imposed for Cuora galbinifrons (including bourreti and picturata as subspecies) at CoP16 (CoP16 Prop.32), effective 12 June 2013. The genus Cuora, including C. picturata, is included in Annex B of EU Commission Regulation no. 709/2010 (amending EC Regulation 338/97), which requires that a corresponding import permit must be issued by the country of import before a shipment of the species can enter the European Union. Only one of the three localities that was found to harbor C. picturata is currently protected (Deo Ca Protected Forest). 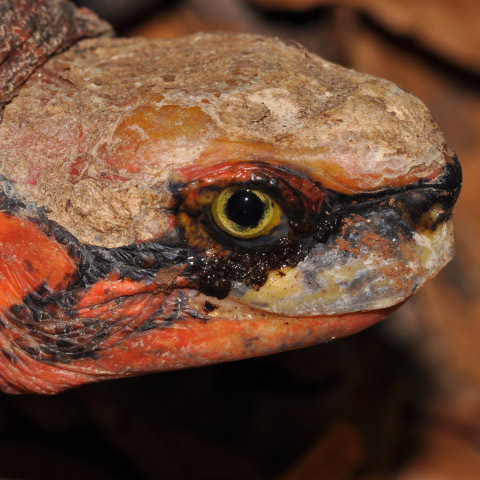 Additional field surveys on the Langbian Plateau are needed to determine whether C. picturata occurs within any additional established protected areas that will safeguard it from deforestation and overharvesting, and if not, what can be done to mitigate its extinction in the wild (Ly et al. 2011). However, Deo Cao only protects the forest itself but not the animals living in it. Extensive timber logging was reported during a visit in 2012 showing that legal designations seemed to have little effect (Blanck et al. 2016). Cuora picturata is apparently restricted to the eastern slopes of the Langbian Plateau, being known only from Khanh Hoa and southern Phu Yen provinces of southern Viet Nam (Ly et al. 2011; Struijk and Blanck 2016; Blanck et al. 2016). May also occur in eastern Dac Lac and northern Ninh Thuan provinces. By analogy with the biogeography of better-surveyed syntopic primates, Ly et al. (2011) postulated that the Cuora galbinifrons-bourreti-picturata group inhabits three discrete, disjunct hill forest areas, of which the range of C. picturata matches that of the Yellow-cheeked Gibbon (Hylobates gabriellae) and Black-shanked Douc Langur (Pygathrix nigripes) in being restricted to the eastern slopes of the Langbian Plateau. This region covers an area of less than 250 x 100 km (25,000 sq. km). Cuora picturata was originally, at the time of its description in the late 1990s, speculated to possibly occur in eastern Cambodia, as no confirmed field localities were known and specimens only showed up in turtle trade in southern Viet Nam, at points known to be part of the trade routes from Cambodia to Viet Nam and onwards. However, surveys in Cambodia have failed to find any indication of the species there, while the discovery of wild specimens on the Langbian Plateau (Ly et al. 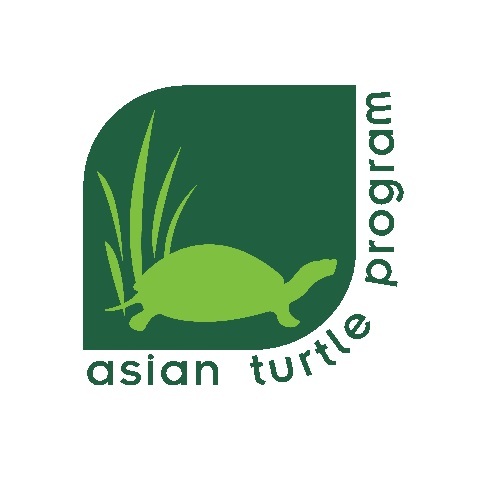 2011) explains how specimens would be part of turtle trade in southern Viet Nam. Population density of Cuora picturata is considered to be low. Ly et al. (2011) carried out field surveys throughout representative periods of the year, and required 15 days of a 4-person team with three trained hunting dogs (60 man-days, or 480 man-hours; 45 dog days or 360 dog hours) to encounter eight turtles, translating to 60 man-hours and/or 45 dog-hours per turtle. During a field survey in May 2012 in Deo Ca–Hon Nua Special Use Forest (a traditional collecting area in Phu Yen province, Viet Nam), a team of five dogs (four local hunting dogs and one trained survey dog) found only a single C. picturata and two C. mouhotii during a week of searching in which dogs were actively used over 21.7 km of transects (McCormack, unpubl. data; Blanck et al. 2016). Assuming that a team of dogs works a strip of a minimum width of 100 m, and finds half of all exposed and hidden turtles, this calculates to an estimated density of less than one C. picturata per sq. km, or one turtle per 280 dog hours. A great deal of survey work has been undertaken in Viet Nam between 2009–2012 focused on determining the range and priority habitat for the C. galbinifrons group, with a focus on C. bourreti and C. picturata. Anecdotal information from interviews concluded that historic quantities of the species available for collection in the forest have been greatly reduced, with many hunters stating that while these box turtles were common 7–15 years ago, they are now increasingly difficult to find. The overall extent of occurrence (EOO) of C. picturata is less than 25,000 sq. km, of which much is likely unsuitable as a result of being below or above suitable altitude, as well as large areas of suitable habitat at suitable elevation having been converted to agricultural purposes. The remaining area with suitable habitat (area of occupancy) for the species (AOO) is only about 3,000 km². The global surviving wild population is probably below 25,000 individuals, likely no more than 3,000-10,000 at best. The primary threat to Cuora picturata is collection for trade. The species is in high demand in the international pet trade and the Asian consumption trade. 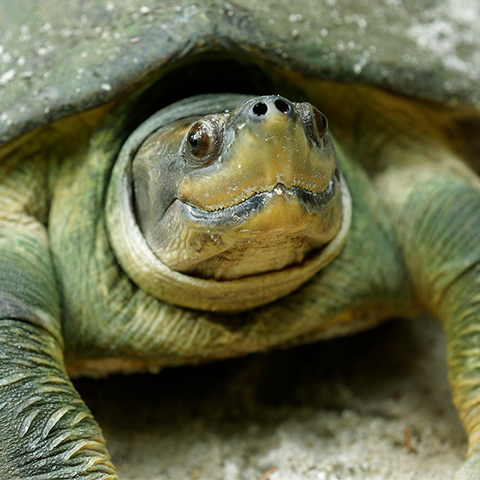 Collection efforts are targeted and occur mainly as searches for turtles involving trained dogs. 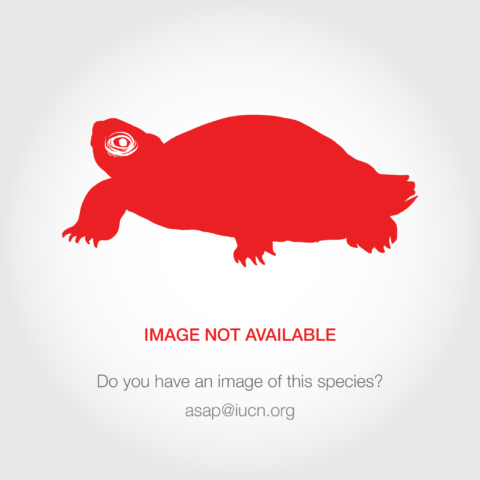 Turtles, of any species, are collected whenever and wherever encountered in the region, regardless of legal protection status or location inside protected areas. 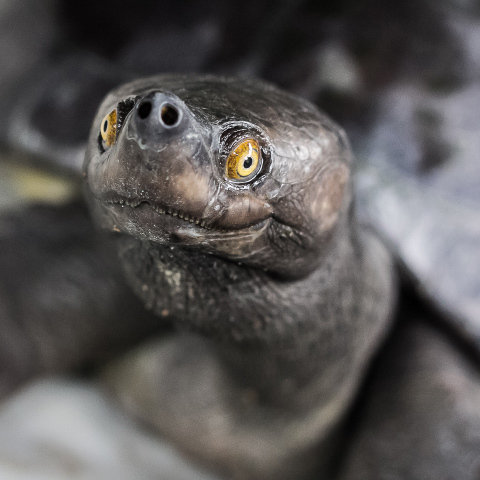 Collected turtles are traded, mostly illegally, through a network of local middlemen before being exported or consumed locally. Increasing economic value has ensured that hunting pressure is sustained despite the increasing rarity of the species (Hendrie 2000; McCormack et al. 2010; Ly et al. 2011). Habitat loss and degradation are considered a significant but more localized threat to the species (Ly et al. 2011). Large areas of forest on the Langbian Plateau are being rapidly converted to coffee plantations and other agricultural lands. Only one of the three localities where C. picturata was found (Deo Ca Protected Forest) was protected at the time (Ly et al. 2011). Most animals end in the Chinese pet and TCM trade. Current prices in China are $150 for an adult, compared to $20 in 2005.